As a result the heavy rains and floods in Alberta in June 2005, half of the park's 110km of trails were washed away, and the other half was damaged or required extensive clean-up. The floods also destroyed seven pedestrian bridges over the Fish Creek and seven others were rendered unsafe. 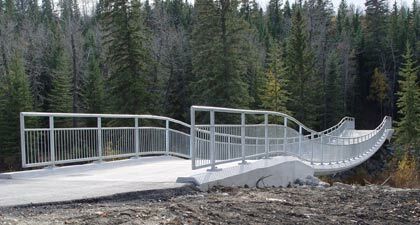 Since the flooding of 2005, Fish Creek Provincial Park has engaged in an extensive reconstruction plan and Trevcon Enterprises Ltd. was proud to work with the Park to reconstruct four of the bridges that were destroyed during the flooding. Bridges reconstructed included bridges 4 and 5 at 30m in length and bridges 6 and 7 at 40m in length. In order to complete the entire project, Trevcon sub-contracted Beck Drilling and Environmental Services Ltd. to supply and install the rock anchors. The bridge precast panels were supplied by Lockwood Brothers Concrete Products.